DiodeVET is designed for applications in minimally invasive surgery, open surgery and bio-stimulation for small and large animal care. Emitting in the near infra-red portion of the spectrum, it has unsurpassed absorption in water and hemoglobin, which allows controlled tissue ablation and enables a bloodless field for most surgical procedures. Unlike other lasers, DiodeVET cuts and coagulates optically with negligible collateral tissue damage, charring, or recession. Many procedures using DiodeVET are pain-free, minimizing or even eliminating the need for anesthesia. Laser surgery means less pain, blood loss, and swelling as well as a reduction in post-surgical infections. Compact and Handheld – DiodeVET fits easily into the doctor’s office or operating suite. This state-of-the-art 980nm laser is “table top compact” and portable, weighing only 18 pounds. The stylus-like hand piece fits easily in the doctor’s hand and can be formed to improve access to the point of use, without the hassle of an articulated arm. Quick to set up – DiodeVET runs from any standard electrical wall socket and is ready for use within seconds. Need to move it? Just pack up the transport case and go. You can be set up and ready in a new location in a matter of minutes. 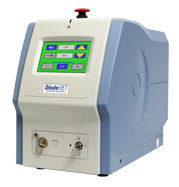 No maintenance or service requirements – DiodeVET is a solid state laser system with no moving parts and no need for regularly scheduled service. If service is ever required, just ship the laser to us for depot repair, no expensive field service calls. Easy to use – DiodeVET’s touch screen with a menu driven interface is user friendly and intuitive. This gives the practitioner immediate access to optimize treatment parameters for power and laser pulse using the included footswitch to control laser operation. High power density and low divergence angle – DiodeVET uses a unique diode-to-fiber delivery technique that delivers a powerful laser spot with a low divergence at or near the fiber tip for either contact or non-contact operation. The combined performance of up to 30 watts of 980nm wavelength light delivered via a small diameter fiber optic cable creates a high power density for quick and precise surgery. Email: info@diodevet.com |	Copyright 2019 B&W Tek, Inc.